The EU’s Eastern flank has become a principal focus of security debates within NATO in the run-up to the NATO Warsaw Summit (8-9 July 2016). Plans are progressing for four battle groups to be based in Poland and the Baltic states, there will be “tailored measures to enhance defence and deterrence in the Black Sea region”, and NATO’s support for Ukraine will be boosted with a Comprehensive Package of Assistance to the building of stronger security structures. In the run-up to the Warsaw Summit and the publication of the EU's new Global Strategy, the Caucasus Institute for Peace, Democracy and Development (CIPDD) has published Security Alert on the EU's Doorstep: Strategies for Strengthening Security in the Eastern Partnership Countries, which will be presented at a roundtable event hosted by the Polish Institute of International Affairs (PISM) in Warsaw on 21 June 2016. For registration, click here. While the Kremlin portrays the current NATO exercises in Poland and the land-based anti-missile shield stationed in Romania as threats that will require a response, NATO is strengthening deterrence and its defences, not building attack capabilities. The authors of Security Alert on the EU's Doorstep, Ghia Nodia, Chair of CIPDD, Jan Piekło, Executive Director of the Polish-Ukrainian Cooperation Foundation (PAUCI) and a co-Founder of New Diplomacy, and Jeff Lovitt, Chair of New Diplomacy, argue that "NATO needs to have a sustained, long-term strategy – not only to contain Russian aggression through effective deterrence, readiness, and defence capabilities, but also to set the agenda, rather than engage reactively to 'unexpected' actions launched by the regime of Vladimir Putin. A better prepared NATO with a strong, convincing deterrent capability will make President Putin understand that the costs of an arms race are too high on all counts, and that NATO remains the most powerful military alliance on the planet, and one that represents stability and security to the common neighbourhood of the Caucasus and Black Sea region." They argue that NATO should go beyond building the capacity to enforce Article 5 and the collective defence of NATO members "to build security throughout the EU’s neighbourhood, East and South. In the case of the EU’s Eastern neighbours, that means to ensure that Russia faces high costs for any further aggressions such as the Russia-Georgia war of 2008, or the annexation of Crimea and invasion of Eastern Ukraine in 2014." Governments of the Eastern Partnership countries "need to acknowledge that they must overhaul their governance systems, which pose an existential threat, primarily in the fields of fighting corruption and implementing security sector reform. They should bring their security policies and command and control structures in line with NATO standards and norms. They will receive more assistance from external actors if they place even greater emphasis on strengthening their democratic credentials through zero tolerance for corruption. They should also reach out wherever possible to embrace contacts between representatives of communities in conflict zones to de-escalate tensions, and foster trust and constructive dialogue." 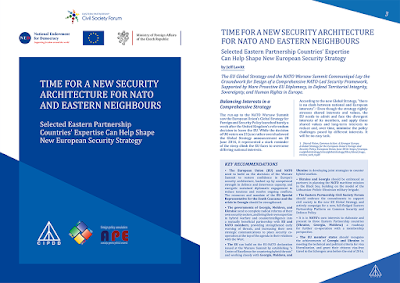 Civil Society in the Eastern Partnership countries "should build expertise in the security field, and should participate as an 'added value' expert partner in the new Eastern Partnership Platform on Common Security and Defence Policy". The European Union "can become an even more valued partner to NATO by issuing a declaration to the Warsaw Summit, committing EU members to support the strengthening of NATO’s Eastern flank (without duplicating NATO’s military capability and command structure), and to co-operate with NATO in the areas of maritime security, supporting partners in training and capacity building, security sector reform, joint exercises and the establishment of 'a Centre of Excellence for countering hybrid threats'. The EU and NATO will mutually benefit if they pool funds and expertise together in a dramatic investment in security sector reform – including military and intelligence reform in the Eastern Partnership countries." NATO "will have a much greater understanding of imminent threats, and earlier warning, if it focuses strongly on its Eastern flank and drafts plans for closer co-operation with the Eastern Partnership countries. This engagement and intelligence-gathering are crucial at a time when misunderstandings and misinformation can trigger a dangerous escalation of conflict with Russia. NATO and the Eastern Partnership countries are deeply interdependent in security terms. While the Alliance is not obliged to defend non-members, the reality is that any future crisis in NATO’s immediate vicinity will have an immediate impact on relations among Alliance members, as well as on how Russia sees the Alliance. "Thus, resilient and well-prepared neighbours are a key NATO objective. In this context, the Alliance can bring the EaP countries into the strategic dialogue around deterrence strategy, include them in operational planning platforms, assist them in military training, intelligence support, joint military exercises, and standardisation of defensive weapons systems to improve co-ordination and training, and launch a special focus on security in the Black Sea basin. It is in NATO’s own interests to elaborate and present to three Eastern Partnership countries (Ukraine, Georgia, Moldova) a road map for further co-operation with a membership perspective at the end." The speakers at the roundtable event in Warsaw on 21 June will include Jan Piekło and Ghia Nodia, as well as authors of imminent country studies for the same CIPDD-led project from Armenia, Moldova, and Ukraine. The meeting will be held in English. For registration, click here. 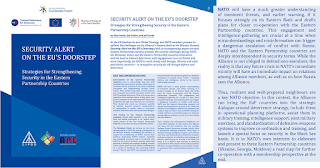 To download the publication, Security Alert on the EU's Doorstep: Strategies for Strengthening Security in the Eastern Partnership Countries, click here.